ITIL 4, the latest release of ITIL, is here! It is not a minor overhaul of the previous ITIL V3 but a completely revised body of knowledge. Will there be an updated ITIL® Process Map for ITIL 4? We have been providing ITIL process templates for some 13 years. Our first edition of the ITIL Process Map was based on ITIL V2, and as ITIL V3 and ITIL 2011 became available in 2007 and 2011, updating our line of products was a straightforward matter. 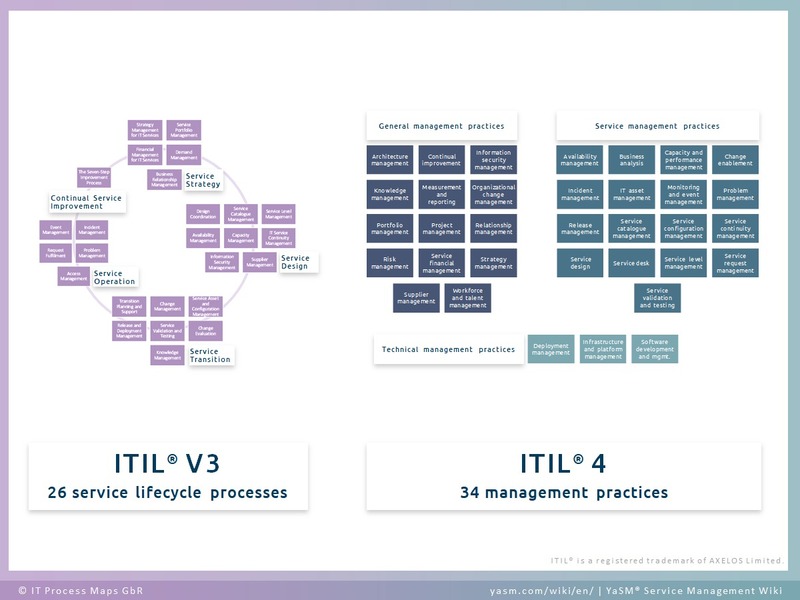 With ITIL 4, the situation is somewhat more complicated. This is because ITIL 4 no longer defines 26 processes but describes 34 "management practices" (see fig. 1). Some of these practices correspond to the ITIL processes as we know them, but others are more like principles, management techniques and organizational capabilities. ITIL 4 is not prescriptive regarding processes, and organizations enjoy more freedom when designing their processes. As a result, there is no default way of translating the ITIL 4 practices into a process model, as we have done with ITIL V3. This is a bit of a challenge, but also an opportunity to take a fresh look at the service management processes. First of all, it is wrong to dismiss the ITIL V3 processes as no longer relevant. AXELOS state that the new ITIL 4 does not invalidate the earlier ITIL V3 (2011) core publications. The detailed processes as specified in ITIL V3 are therefore still valid guidance, and we will continue offering our ITIL process model - the (ITIL V3/2011-based) ITIL Process Map. What's more, we have already started to offer a leaner process model called the YaSM® Process Map, in response to the recommendation in ITIL 4 to keep things "simple and practical". The YaSM model is in tune with ITIL and other modern service management frameworks and approaches, such as VeriSM™, FitSM and SIAM®. We have given it a streamlined, clear structure so the YaSM service management processes are a good fit for the flexible operating models favored by today's service providers. The point is, if organizations are to define tailor made processes and use advice from multiple frameworks, they need process templates to start with that are somewhat less complex than the ITIL V3 processes. To ensure the YaSM processes provide the complete picture of service management best practice, we used ISO 20000 as a benchmark. YaSM is thus 100% compatible with ISO 20000 (ISO/IEC 20000:2018), the international standard for service management. A complete introduction to the YaSM process model.